88 Energy (AIM:88E; ASX:88E) just bought a discount seat with VIP status at the big boys’ table. 88E moved fast whilst oil prices are temporarily low, and with no other competition, has significantly increased the upside to an oil find on the current well. This is essentially a wakeup call straight to oil majors across the globe who would likely be running the numbers on this plucky oil explorer as you read this. 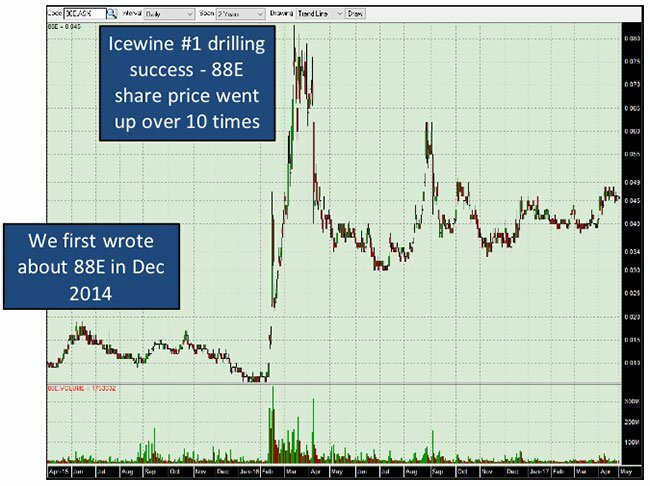 With the recent acreage acquisition expanding Project Icewine dramatically, a few cashed up eyes must be watching 88E’s current drilling progress, waiting to pounce on the results and take a stake in Icewine well # 2. Now, this is speculation on our part and your own due diligence is required if you are considering making an investment in 88E. The current well aims to de-risk 88E’s HRZ/Hue shale play – the one with the billion barrel potential we spoke about previously at the Next Oil Rush in the article Drilling in Weeks to Unlock World-Class Shale Play: Months of Catalysts Ahead . Take that billion barrel potential and multiply it now. We’ve been following the 88 Energy (AIM:88E; ASX:88E) story for some time now, and its plans to de-risk a play that was identified using the same method which effectively identified the sweet spot in the Eagle Ford Shale. At first we thought that was pretty ambitious. But we didn’t have any idea just how ambitious it was. 88E has just done a deal which flags its intentions loud and clear, and provides the majors in the area a compelling reason to look at their acreage position with envy. For a measly 20% down payment of US$740k – just 4% of 88E’s current market cap – 88E has more than doubled the potential of the Icewine Project. 88E investors’ exposure to the huge unconventional prize has been magnified multiple times over. Exposure to the conventional plays has more than doubled. It’s hoping to reel in a big fish, and it’s just switched up the bait. We here at The Next Oil Rush love to see companies taking a calculated risk to potentially send shareholder value sky-high. This is no guarantee of course – such is the world of speculative small cap explorers – and like all exploration wells and potential play openers, there is always a chance that 88E is unsuccessful. Prior to the well results on Icewine-1, 88E’s latest acreage deal has the potential for it to transform into a mid-weight player in Alaska if the well is a success. 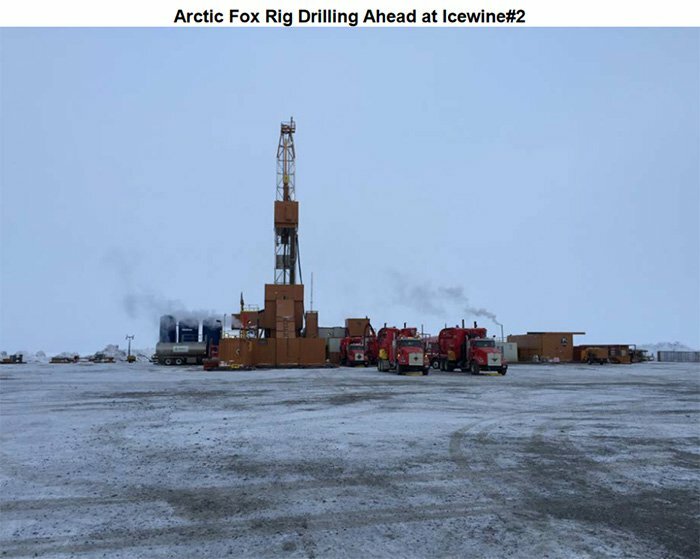 88E has essentially swung a deal with the state of Alaska to triple its acreage position , even before its flagship Icewine-1 well has hit target zones. Now *that’s* a bold move. The deal will see the Icewine joint venture pick up 174,240 acres adjoining its current Icewine acreage. This means the JV now has a majority stake (subject to final payments) on a contiguous acreage position of 272,242 acres in total. 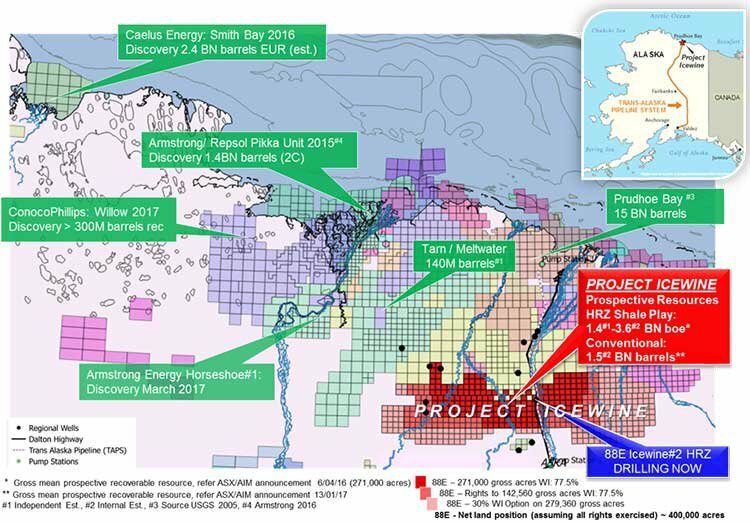 88E’s Project Icewine just grew some wings – now set to fly? 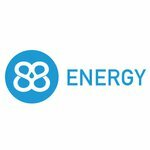 What the deal does is provide a turbo-boost to 88 Energy’s reserves position. With the new deal however, that goes up to a whopping 2 billion barrels of oil. You often hear people talking about counter-cyclical investing and being bold in the world of oil, but 88E is well and truly walking the talk right now. So far all the talk has been about Icewine geology and the conventional and unconventional potential of Icewine-1 (more on that later), and managing director David Wall has previously talked strategy too. He previously told news site Finfeed that the company was being watched. Upon completion of the game-changing deal, he said the new acreage would give 88E the scale needed to talk to the big boys in the region. “Whilst we do not have definitive data that the HRZ play will be successful, the option value associated with the success case versus the relatively small down payment required is an opportunity than cannot be passed up. Interestingly, Wall also told Finfeed that oil companies had not been looking at acquisitions in 2015 because they couldn’t justify the costs of doing so at a time when they were cutting down investment. With a possible turn around in oil price looming in 2016, the tide is likely to shift back to growth. AND, with a potential carrot now three times larger than it had been offering previously, it could be that the prize for a potential farm-in partner or acquirer becomes simply too good to turn down. So far, the supermajors in the area haven’t really gone too far south, as the likes of 88E have picked up the slack in the exploration stakes. As you can see, there are some heavy hitters in the state with the likes of Shell, Eni, ExxonMobil, and BP all looking for oil. They’ve focused on the more proven oil fields of Prudhoe Bay to the north and others, and who can blame them? If you are a large, conservative major, a low price oil environment isn’t exactly a great time to be poking around for an unproven resource. That’s where higher risk / higher reward plays like 88E come into their own – 88E is a small explorer at the pointy end of the stick trying to create huge returns for shareholders – by converting the unproven to the proven. And if there’s one way to tempt the Majors down south, it’s to drill up some positive results, and provide them with the opportunity for scale that they need to move the needle on their already massive, multi-billion dollar market capitalisations. 88E is doing just that, taking advantage of a low-cost oil environment to snap up all the acreage it can, on the cusp of its drilling results. When oil was riding high at $100/bbl, the level of competition would have made this bold acquisition strategy impossible. But, this is a new world and 88E has adapted. The acquisition of the new land was secured by a down payment of about 20% of the costs, roughly $A1.3 million. While it has a $50 million facility on hand with the Bank of America, most of that cash will be sunk into the ground in the form of drilling and new 3D seismic. To fund the acreage acquisition and potentially pick up some recently acquired 3D seismic, 88E launched a small capital raising recently. 88E raised $3 million from institutional and sophisticated investors via the placement of 300 million shares at 1c each. It reportedly went down like the mother of all parties with the offer “strongly oversubscribed”. It was a sign that the institutional investors were well and truly on board with the new strategy. These are investors that don’t hand out money to fund any old punt, but ones that show vision, craft and good sense. Retail shareholders are also being offered the chance to buy in, with 88E attempting to raise $2 million, with shareholders able to pick up parcels of $15,000 worth of shares at 1c each. However, this could rise to $3 million if the demand is there. The SPP closes on December 11 th , with those shares to be issued on December 22 nd . Again, we must stress that the upside is dependent on 88E finding oil at Icewine-1 or getting a high value farm-out, so you should weigh the investment up carefully if you’re thinking of taking part. The key to unlocking the full value from the increased acreage position is successful drilling at its current acreage, where 88E is trying to prove up a previously un-tapped play. It’s called the ‘HRZ shale’, and it’s virtually unheard of in Alaska to be able to go after underexplored plays which haven’t already been staked out by the majors. To the north of 88E is private company Great Bear Petroleum and recent arrival Otto Energy (ASX:OEL). Until fairly recently, Great Bear was on its own and being a private company there was limited look-through on any drilling it may have been doing into the HRZ or conventional horizons nearby. However, with OEL now on the scene, 88E investors will have a lot more look-through on nearby drilling simply because OEL will need to disclose information to the ASX. What is known so far is that Great Bear has drilled two wells into the HRZ, and found it to be a condensed thick marine shale with an average thickness of 55m. Those two wells, combined with over 5 years of work by JV partner Burgundy Xploration, are the best indication yet of what the HRZ may hold, and the two wells intersected oil shows over 180m through both the Hue and HRZ while the rock was found to have total organic content of up to 8%. The technical details also revealed that the rocks had similar mechanics to that seen as the Bakken, Barnett, and Marcellus shales – which are all mammoth shale plays in the lower 48. The wells also showed that the HRZ had porosity of 18.4%, which is simply unheard of – in a good way. 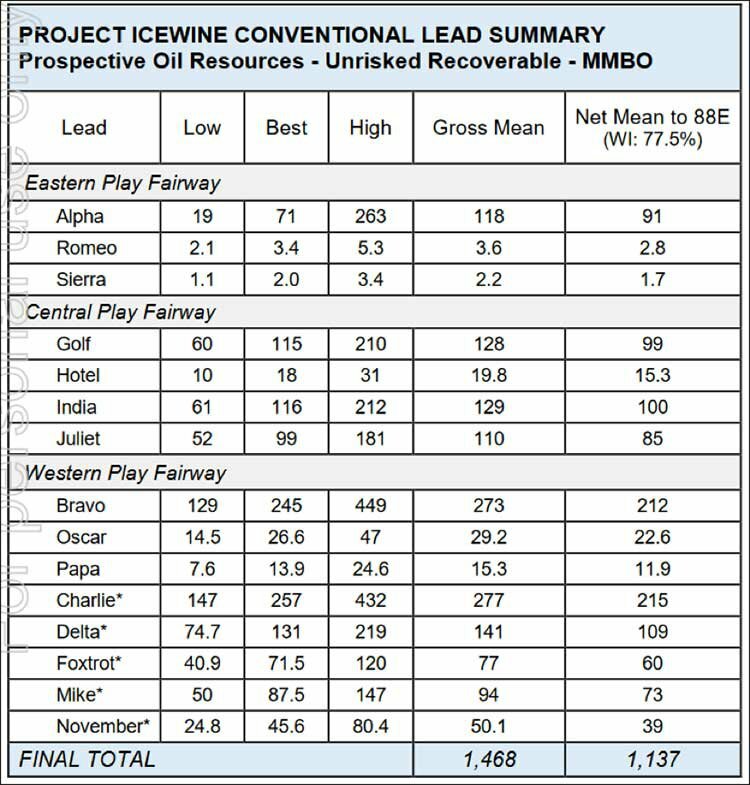 This is just data from two wells though, and although they are close to 88E’s acreage, the company will have a better idea of what it’s sitting on with Icewine-1 and potential follow-up well Icewine-2. To get more information on the potential of the HRZ shale and Hue formation, 88E is currently drilling away with Icewine-1, the first step in a three-stage program which could significantly de-risk the HRZ and open up the play onto the new acreage – and attract a farm in partner for the drilling of Icewine-2. The forward plan is to drill the remaining Brookian section before setting casing above the primary HRZ shale target. Depth remains at 8,773m, with testing of the Blow Out Preventer system successfully completed over the weekend and the rig currently running back in hole with drilling having recommenced. The next casing point is at circa 10,450’ before setting 7” casing and commencing coring operations in the lower Hue/upper HRZ, which is the primary target for the Icewine #1 exploration well. The overall plan is to drill down to 11,600 feet (3,536m), enabling it to drill right through the target. Once it has drilled through, it will have a whole spate of early numbers to work with. Some data will be available immediately, while some will need samples to be sent back to the lab to verify. In the first half of next year, it will conduct a 3D seismic survey over the area to get juicier geotechnical data for 88E and its investors to chew on. However, in the meantime some recently acquired 3D data may be purchased to fast track the conventional play evaluation. How do the majors choose a project? With a lot of potential acquisition targets out there for oil majors, there is a conventional wisdom of which projects the big players can go after. And it’s not like shooting darts, there are mathematical formulas behind their farm-in selections. The concept is the ‘ Expected Monetary Value ’ – or EMV. To calculate a project’s EMV, it’s simply the (Probability of Commercial Success x Potential Value on Success) minus (Probability of Failure x Cost of Failure). The higher the number, the more attractive the project. The project will require 10 horizontal appraisal wells to prove up the play at US$35M each (before Alaskan rebates), which is a total of US$350M. If you plug those numbers into a spreadsheet, and use a 30% chance of success, you will have a US$1.5 – 2.7 billion EMV for Project Icewine. That must be a number that gets the majors picking up the phone to 88E – assuming the company can successfully de-risk the play over the coming months. At the same time, we must stress – those assumptions are exactly that – assumptions – no one really knows what the price of oil will be down the track, and there are a myriad of things that could happen over the coming months – for those reasons, the above value are just guesses – so don’t hang your investment on those numbers alone. The vast majority of shale wells in the US are drilled as horizontal wells, and it’s not so much hydraulic fracturing as horizontal drilling which has powered the recent shale gale. The video below provides an overview of the difference between horizontal and vertical drilling. The main difference is that horizontal drilling allows much more in-situ access, which allows more oil and gas to be released. 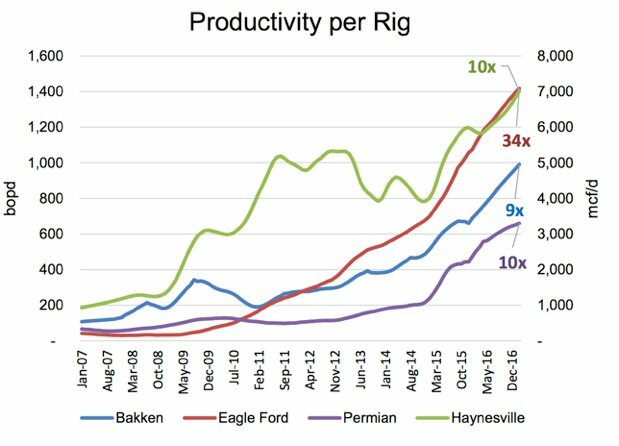 It’s horizontal drilling which powered the shale gale because oilers were afforded access to much more oil and gas than they ever had from wells before. However, there is a flip-side. Horizontal wells are more expensive to drill, while vertical wells are less expensive. It’s your classic risk/reward scenario. At this stage the indicative plan from 88E is to drill Icewine-2 as a horizontal well, going for 6000ft of access within the HRZ shale. But, this could change depending on nearby results, including any drilling being done by Great Bear/OEL to the north. As outlined before, 88E does have a $50 million facility with the Bank of America to fall back on to do the drilling, but thanks to a generous rebate scheme set up by the government of Alaska, it will end up spending nowhere near that much. The plan is to bring in a Major before the larger spend requirement associated with the Icewine #2 Horizontal Well. So spending only US$8 million may lure a supermajor to the party and unlock a massive play – sounds like a pretty good deal to us. In many ways, 88E represents the best of small cap investing. It’s taking a counter-cyclical punt which really could buy it a seat with the big boys. Instead of taking years and years to chip away at the lower end to buy it a place in the middle, it’s aiming high. It has tripled its acreage position – potentially tripling its upside potential. Its early work has been enough to convince 88E to undertake the bold move, and we can’t wait to see how this company shooting for the stars goes.